Beneficiaries of the programme from Manipur, Meghalaya and Odisha talk about how their lives were transformed thanks to the newly built roads. Roads are the arteries through which India’s economy throbs and thrives. By connecting farmers to markets, children to schools, rural to urban areas and the sick to hospitals, roads have become vital for economic prosperity and poverty reduction. 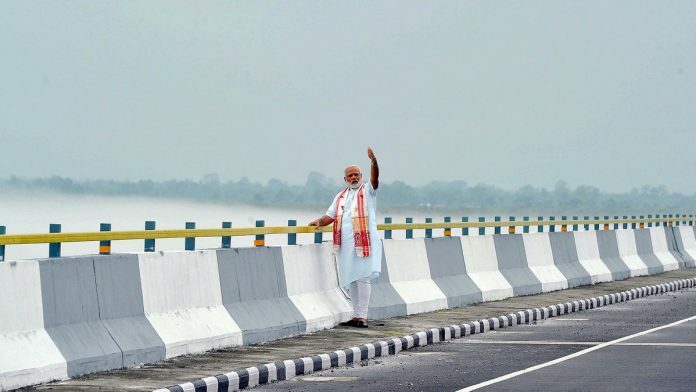 And that is why Prime Minister Narendra Modi kickstarted India’s road building mission with an ambitious and exacting daily target of several kilometres of newly built roads. India’s expansive road network consists of about 65,600 km of national highways, 64,200 km of state highways and major district roads and approximately 2.7 million km of rural roads. Although nearly 70 per cent of India’s population lives in rural areas, about 40 per cent of rural areas were not connected to all-weather roads, even after seven decades of Independence. Where they were connected, the road quality was not always of the best standards. With poor maintenance and earthen tracks, several rural roads became unsuitable for motorised traffic, especially during the monsoon months. The credit for addressing this important, but much-neglected, problem goes to former Prime Minister Atal Bihari Vajpayee. On 25 December 2000, his government launched the Pradhan Mantri Gram Sadak Yojana (PMGSY). The main objective was to provide all-weather roads to eligible un-connected habitations. It was envisaged as a fully Centre-sponsored scheme with Rs 0.75 per litre cess on high speed diesel earmarked for this. Rural areas with populations of 500 persons and above as per Census 2001 in the plains and those with 250 persons and above in Special Category were eligible for road connectivity. The latter comprised the northeastern states and those with difficult terrains such as hills, deserts and tribal and backward areas. Nearly 1.7 lakh habitations became eligible under this categorisation. The National Rural Roads Development Agency (NRRDA), an agency of the Ministry of Rural Development, managed this programme, while state agencies implemented it. The United Progressive Alliance (UPA) government carried on with this scheme, albeit under its larger umbrella of ‘Bharat Nirman’. However, 14 years after its inception, by March 2014, just about 55 per cent of the eligible habitation had been connected. Under Prime Minister Narendra Modi’s government (that reverted to the PMGSY nomenclature), this figure catapulted to nearly 82 per cent by end of 2017. The quantum jump was possible due to an enhanced construction rate of 130 km of roads per day in 2016-17 – the highest in seven years until then. A look at the figures in the portal that has been created to identify targets and monitor progress – the Online Management, Monitoring and Accounting System (OMMAS-GIS) – is revealing. From 3,81,314 km of roads constructed in 2013-14, the figure has jumped to 5,50,575 km in 2017-18. The galloping speed prompted the government to not only enhance financial allocation to the scheme, but also bring ahead the target for 100 per cent completion to 2019 from 2022. The literal last-mile connectivity in the 18 per cent rural habitations left unconnected is attributed to several factors. From the harsh terrains of states such as Jammu and Kashmir, Uttarakhand, Himachal Pradesh and the northeast to the Naxal-affected districts in Chhattisgarh, Jharkhand and Odisha, the PMGSY is fighting against several odds. Interviewing some beneficiaries of the scheme has been revealing. The habitations of Amliya, Bhathotoli, Kharkakhas and Mahuatoli in Jharkhand’s Gumla district were totally cut off from modern civilisation. In these deep pockets that are infested by Maoist terror, a nearly 8 km road from Bharno Chatti to Kharkakhas came up under the PMGSY in June 2018. The executive engineers spoke about several operational challenges and implementation troubles in this project worth Rs 332 lakhs. The increased mobility has helped the residents access schools, panchayat bhawans, anganwadis and healthcare centres. It has also provided the villagers an opportunity to supply their agricultural and diary produce to the market. However, maintenance becomes an issue when the Maoists blow up these roads in their war against the state. In the hilly Ukhrul district of Manipur, R.K. Mera a local resident narrates how the 5.35 km road from Gwaltabi to Thawai has improved the lives of people. “Our children are now able to get to the government high school and us to the primary health centre. The pucca road has given employment opportunities to some of us who are driving private taxis. It is easier to get to the nearest market place – the Yaingangpokpi Bazar – where local produce can be reached for sales. We notice better maintenance of power and telecom services in the area after this road came up in 2014,” he said. Tiphar Marbhaniang in Meghalaya’s Kharangoi is the secretary to the village headman. His village is part of the East Khasi Hill district of the state. In 2016, three villages were connected by a 4 km road from Sohiong Pariong. These villages were Kharangoi, Mawlyngthoh and Wahnongbah. “Most of the people in these three villages, which make up a population of about 600, are farmers. We had a very difficult time getting to sell our produce to the nearest marketing centre or to the state capital Shillong. This road has come to us a blessing to ensure that we can get our products out at comparatively lower haulage cost. Several of us had not even seen the health and educational centre in Shillong. Now it has become so easy to make daily trips when required,” said Marbhaniang. Similarly, several tribal dominated villages such as Bandav, Dudhkundi, Balichitri, Bhugudakata, Hatibari, Barhagenja and Nuamania in Odisha’s Mayurbhanj district have been connected. The 8.72 km road from Chandua to Nuamania strings these villages along. Sankha Beshra at Nuamania mentions how the road has become a lifeline for the tribal people in these villages. “There has been a sudden spurt in job opportunities and in vehicular traffic here with buses, trucks, jeeps, tractors, ambulances, auto-rickshaws where hitherto bullock carts traversed muddy, rickety lanes. It has become easier for us to get to the block headquarters at Kuliana, and district headquarters in Mayurbhanj as well as our state capital Bhubaneswar to get health, education and judicial facilities,” says Sankha. The hill state of Uttarakhand was adjudged the best-performing state in 2017-18 with 1,839 km of roads constructed under the scheme, against a target of 1,500 km set for the year. Over 200 habitations were connected in the process. Buoyed by the success of the PMGSY, India inked another agreement with the World Bank in May 2018 for additional financing. A loan pact of $500 million (Rs 3,371 crore), with a three-year grace and a 10-year maturity period was signed. Since the inception of the PMGSY, the World Bank has invested over $1.6 billion in the project, which has helped build and maintain nearly 35,000 km of rural Indian roads. These minor hiccups notwithstanding, the PMGSY is well on its way to ensure that the last mile of the scheme providing coverage and connectivity to every corner of India is achieved as per the 2019 deadline; and transforming the lives of the people it touches. This is the sixth part of a series on the author’s conversations with beneficiaries of schemes launched by the Narendra Modi government. Read the others here. The author is a writer/historian/political analyst and a Senior Research Fellow at the Nehru Memorial Museum and Library.